The PTFE is fluoro-polymer possessing, which is a unique amalgamation of frictional, chemical, thermal, and electrical properties. These are of non-stick nature, non wetting and is self-lubricating. Resistant to chemical, these fillers are unaffected by all known chemicals except alkali metals, fluorine under certain conditions. These are resistant to chemical as well. The best of the solid dielectrics an excellent insulator, PTFE has the widest working temperature range. 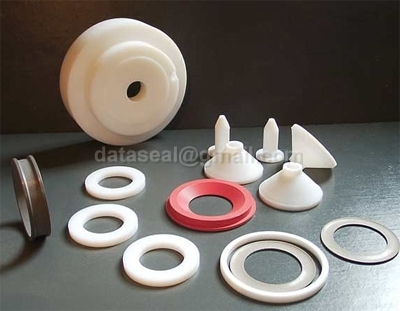 Mechanical performance can be amended and other superior property of PTFE is maintained by adding to PTFE filler which can stand PTFE sinter temperature (360oC - 380oC). Our range of Gaskets can be made of PTFE Filled Grades viz:- glass fiber, metal, metal oxide, graphite, MoS2, carbon fiber, polyamide. Some of our range are O-rings, gaskets, pumps impeller, valve seals, bushes, V-rings, Expansion bellows, sleeves in heat exchanger equipments, piston rings, metal molded with PTFE, valve holder, barb insulator, hydraulic seals, Diaphragm, Bearing plates, piston Rings, Pipe & Tubings and others.